Spring has finally sprung, and I’m pretty sure that I’m not the only one who’s excited about it. With this new sunny season comes so many of my favourite styles. And given all the sandals, sundresses, and my go-to white skinnies, I think it’ safe to say that spring style just might be my favourite. So to get all of you excited for the sunshine that’s headed your way during these next few months, I’ve put together a list of my spring wardrobe essentials. Happy shopping! Looking for a great dress to wear to any upcoming spring celebrations? 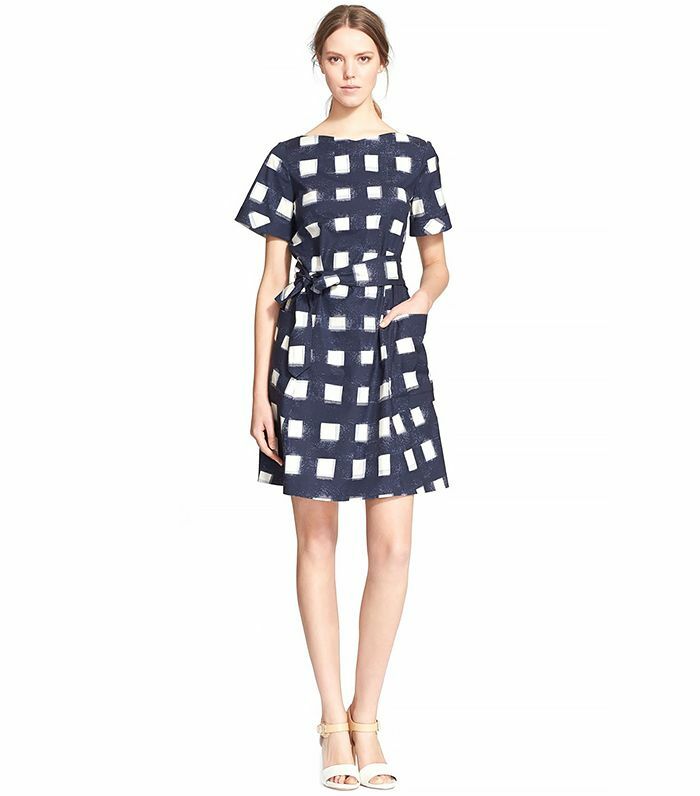 This chic number by Tory Burch will fit the bill! These heeled sandals from my LC Lauren Conrad line are my go-to shoe for spring. They go with every outfit I have in my closet, and they also happen to be quite comfortable. Win, win! Not only does this floppy hat come in my favourite colour (blush), but it’s also the perfect accessory for blocking the rays and it comes with a very reasonable price tag. Bucket bags are currently having a moment. I’m a fan of this black-and-white piece from Phillip Lim. It’s classic and chic, yet a little bit edgy. Crawler earrings are all the rage this season, and I’ve had my eye on this delicate pair from Eleanor Kalle. I love this tank dress from Elizabeth and James for spring, because you can dress it up or down. The sheer skirt adds a little something extra, too. Nothing says spring like floral prints, shorter hemlines and breezy silhouettes. We designed this Paper Crown x Rifle Paper Co. dress exclusively for Anthropologie, and it’s become one of my favourite pieces for this sunny season. Spring marks the official start of tank top season, which I plan on ringing in with this adorable citrus-print silk blouse by Equipment. I have a thing for a great pair of white skinnies. And when the warmer months roll around, I tend to wear them almost every day. This pair from my Kohl’s line happens to be the perfect fit, and they complement all of the pretty floral blouses I’ll be wearing this season. A great pair of sunnies are a springtime essential, and this season I’m loving this Wildfox pair. The yellow-and-pink lenses add a little bit of edge to the classic black frames. I’ve fallen in love with rompers lately, and I don’t think I’m the only one. My favourite one at the moment is this easy floral number by Joie. Just throw it on with a pair of strappy sandals and a denim jacket, and you’re set for spring.